Ok gang. I wrote a post a few months ago called ‘What Is Extreme Couponing? How Can I Get Started?’ This is an update to that original write up. I’m not going to reinvent the wheel. Instead, I’m going to continue on with this concept. Please go back and read the original post if you really want to start from the beginning. There’s a lot of useful extreme couponing information here. Once you’ve brushed up – see below. We all watch the show. You wouldn’t be interested in the topic unless you caught an episode or two of ‘Extreme Couponing’ on TLC. Those people have quite a gift. BUT REMEMBER – they spend HOURS AND HOURS a week figuring out those deals. Can the average person do the same thing? Of course! But do you want to dedicate about 40 hours a week clipping coupons and figuring out online deals? Not many people would want to get in that deep. Instead, I’m offering a different perspective on extreme couponing. How about learning how to save 50% off your grocery bills a week? That’s still worth your time right? Extreme Couponing is… extreme. This other way is much more manageable and feasible for the everyday man and woman. Extreme Couponing: How Much Time Does It Take? More time than you want to commit. 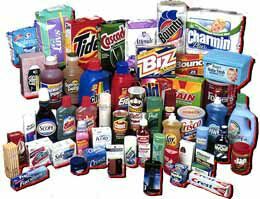 Extreme Couponers live and BREATH coupons. Their houses are filled with products and crates of circulars. At least 40 hours a week is put aside managing such amazing saving numbers. I admire extreme couponers SO MUCH because I just don’t have it in me to cut coupons and search out deals 6 hours a day. I have two kids and one of them isn’t in full time school yet. It’s an impossibility for me. Instead, why not dedicate 30 minutes or so a day to saving money? That’s worth your time, right? Become conscious of the sales surrounding you. 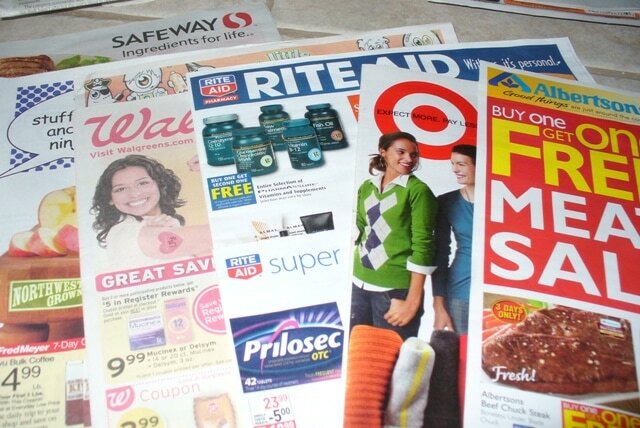 Every Wednesday, I get all the grocery store circulars sent to my house as a preview. I am sure you do too. When they come, I sit through and price check the basic items. Milk, vegetables, orange juice, bananas. I’m lucky enough to live in a town where there are 5 major centers all within 2 miles of my house. If I REALLY wanted to, I could run around and grab the best sales from each store. BUT you also have to consider the gas you are spending doing that if you live somewhere that has grocery stores more spread out. So what should I do? Sit for hours and coupon match with each grocery store circular and their deals? Of course NOT. I do not have the time for this!! Instead, I use sites like ‘Living Rich With Coupons'(click here). I don’t know how she does it… but she has DOZENS of stores to choose from. I pick ‘Stop and Shop’ because that’s the store I typically visit and check off all the deals I want to take advantage of. I also recently started going to ‘King Kullen’. So one day I will visit Stop and Shop and then a few days later I will head over to King Kullen. Each trip doesn’t take that long because I’m not getting a full list of food, right? It’s a few things here and there. But those two trips really add up in savings if you are clipping coupons. Extreme Couponing: How To Save Money On Beauty Products? This is my pride and joy. I write about my CVS trips each week. I am OBSESSED with shopping for beauty deals. Shampoo and conditioner can be really pricy and I’ve purchased enough to last me at least 5 years. I give product to my mother, my grandmother, my in-laws, and sometimes friends when my stockpile gets too large. Couponing can get to be very addicting. Trust me. So instead of having my house taken over, I give it away. Whenever I watch Extreme Couponing on TV, I always see the women taking advantage of beauty deals in the supermarket. That gets me so angry because my stores don’t really have those deals! I’m always like… HOW DID SHE DO THAT???? But I do know how to spend around $3 a week and get about $30-$50 in product from CVS. I am a CVS FREAK and I am going to teach you how to do what I do. See the next section for all my extreme couponing tips. Ok first things first – get a newspaper subscription. Make sure it’s the best one in your area. I live on Long Island and I’ve found that ‘Newsday’ is the best newspaper for coupons. It’s trial and error. Go to the store and buy all the versions one week and see which has the most pull outs. I’ve found that there’s always one that has more pull outs than another. You’ll figure this out in one trip. Subscribe to the weekend edition. There’s no point in you paying for the full week when you only really need the Sunday paper. Now… usually a coupon will say “Cannot buy more than 4 items in one transaction” meaning you can’t give the cashier more than 4 like coupons. I don’t have time to sit there and split up my order like the Extreme Couponing show. You do realize they spend 8 hours at a time checking out?? It’s no joke. I buy what I can within store / coupon policy. So, even if it’s the best deal on the planet – I’m only going to get 4 at most of the item. Remember, I’m not EXTREME. I’m trying to show you how to realistically save a TON OF MONEY for your family and still have free time in your life. Back to the newspapers – if the coupon inserts are really good, I make my husband go out and buy 3 more newspapers that Sunday. We are toying with just having 4 delivered to my house… but right now, we see every Sunday what we are going to do. Now that I use online deal sites to tell me what to buy each week, I’ve stopped cutting coupons. For the last year, I would sit down after breakfast and clip every single coupon and then store it in a binder. I did this because I needed a way to sort through like items. HOWEVER, now that I use online deal sites, all I have to do is actually DATE the inserts. Whenever you look online at sites, they will tell you the type of insert (Like RP for Red Plum) and the date you got it. I print out my list from the deal sites and then I get the inserts they tell me to get. I cut out only the coupons I need for that particular shopping trip and put everything back in my accordion folder sorted by date. Much simpler!! Everything is placed under my desk and no one is sleeping on the couch because of how much space I’m using in my house. The only thing that does take time is pruning out the expired coupons. But that usually happens only once a month. It’s manageable. Every single day, I spend over an hour searching out online deals from deal sites and I link to them in one consolidated post for my readers. This is to save YOU the time each and every day so you don’t have to go on that scavenger hunt. Hey – it’s literally my job. I’m a blogger, and this is my full time gig. I don’t mind doing the work. I actually enjoy it. Click here to see them all. Bookmark it. I do it Monday through Friday. You can print everything I find and by the end of the week, you will have built a pretty nice pile of coupons. For these internet coupons, I do have a binder with folders. I don’t want loose coupons all over my house. It’s much easier to store them in a binder. Also want to say – I update that page all day. If I find a new coupon at 3PM or so, I don’t write a new post. I just add it to that morning’s push. It’s better to have it all in one place. So, let’s use CVS as the example for your first trip. When I started back in January, I think I spent about $25 on my first trip. I’ve been riding that $25 ever since. Stores like CVS make sense ONLY if you shop once a week and ONLY if you are smart about your purchases. You don’t buy an item because it gives you ECB. You buy an item because you are getting it for under a $1 or FREE after the ECB. I don’t buy ANYTHING unless it meets that criteria. These sites tell me exactly what I need to buy each week. They link to coupons that I need to print in order to get the deal and they direct me to the exact insert I need to pull to clip the coupons I need for the trip. THEY DO THE WORK FOR YOU!!! Why not take advantage of it? So, here’s the hard part. You like shampoo brand A and it’s on sale but not really worth it. You think to yourself… I should buy this because it’s a good price, right? WRONG. If you really want to be serious about saving money, you have to let go of all your brand loyalty. This doesn’t work if you are holding out for a Pantene sale. You have to be willing to change things up if you really want to save the most money for your family. This isn’t written in blood. If you REALLY LIKE Pepsi – then buy Pepsi. I’m just saying – when you can… let go. Let’s look at a CVS circular and try to show you what to do and what not to do. Anything that is free – BUY. You spend $.99 but then you get $.99 in ECB for next week. This is what I mean about “riding” my original $25. Let’s say this was part of my original purchase. YES, the $.99 had to come out of my pocket. 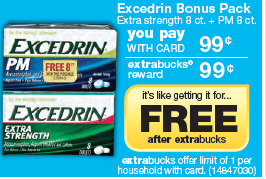 But next week, I will have that $.99 to spend again PLUS I have the Execdrin at home. Next week, I will use that $.99 in ECB to buy something that gives me $.99 in ECB again. You keep spending the same money WHILE stocking up on goods. Does this extreme couponing tip make sense? You see the circular and learn that mouthwash is on sale this week. You say to yourself, “I already have mouthwash. I’m going to skip this deal because I have 2 already in my basement.” I’m going to ask you to think differently. Sales happen in cycles. Sure mouthwash has been on sale a lot recently, but there will be months in the year where it won’t be on sale and you will need it. You buy it when it’s at an extreme couponing price. So this mouthwash is on sale for $3.69. 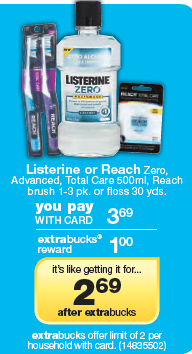 Listerine is really good about coupons. I have several that will work for this in my extreme coupon stash. But let’s just say I use the coupon that is $1.50 off one. Suddenly, after the $1 ECB, I’m spending around $1 for mouthwash. Not a bad deal! Another thing I want to point out – the limit. See on the bottom. It says LIMIT 2. That means you can print the ECB twice for this deal. Typically, at CVS it’s ONCE. So an extreme couponer always has to be aware of these restrictions. If you don’t have a second coupon for this deal but still want to take advantage of the limit 2 – DON’T. Only when it’s $1 and under. It will be on sale again and you will probably have another coupon. Don’t jump on deals that really aren’t saving you the MOST MONEY YOU CAN SAVE. You may or may not have a Lady Speed Stick coupon, but this is a pretty good deal. And according to the ad, you can do it 4 times. This would be a great first time transaction. You will spend $12 but get back 8 for next week PLUS have deodorant for MONTHS. When you start to extreme coupon, you are going to want to SCORE BIG. But it’s not about that. It’s about saving as much as you can that week. I make YouTube videos about my purchases every Sunday and you will see what I take home isn’t a lot. Maybe 6 items or so a week. But that’s FINE. 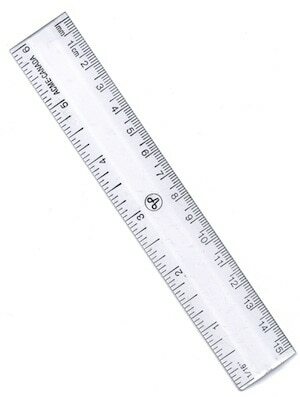 There is no ruler you have to put yourself against. You do the best you can do and then there’s always next week. As I said earlier, I buy 4 newspapers a week. So, that means when the supermarket has a good deal, I am able to take advantage of it four times. That’s enough for me. As an extreme couponer, your house can get taken over…QUICKLY. 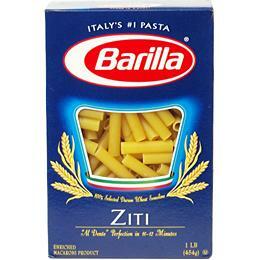 For example – Barilla Pasta. A few weeks ago, I cut $1/1 Barilla Pasta. I’ve been sitting on them because my supermarket likes to have 10/$10 sales on Barilla. When that happens, I will walk in with my 4 coupons and I will buy 4 boxes of free pasta. Not before. If the sale never comes up during my expiration date limits, I don’t take advantage of the deal. You will find most coupons are for unhealthy items – cookies and treats. I stay away from those. I buy side dishes for my dinners – rice, au gratin potatoes, pasta etc. ALWAYS ON SALE. Right now, if you looked in my cabinet – I have about 30 boxes of carb sides. The amount is something I normally wouldn’t have in my kitchen – but they were all FREE. So, I bought them. I do NOT buy items just because they are free. I’m not bringing home sugary snacks and treats for my kids because they were a steal. I don’t want them even if they ARE FREE! It’s not about just being free. It’s about working for your family as well. I can’t go somewhere without trying to convert a friend or family member to become an extreme couponer. I’m OBSESSED with coupons. I mean seriously addicted. I will NEVER EVER buy something full price again. And I mean it. Once you understand how easy it is to coupon and how coupons are basically FREE MONEY – there’s no turning back. So be warned. Ok, we are at the end of the article now. I hope you’ve enjoyed my Extreme Couponing tips for the every day family. Here is your bullet list of TO DOs. Thanks for reading my extreme couponing tips! Previous Post: « Tyler Candles and Prague Market – Live Webcast and Giveaway 11/17! You always do such a great job with your deals. Im in Canada so I wish I could find someone here to offer such great information as you do.